Triple Shot Sports is an advanced simulator, immersing the player in the world of competitive target shooting. 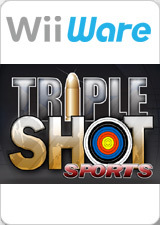 Triple Shot Sports is one of the most advanced recreational shooting games available for WiiWare, immersing the player in the world of competitive target shooting. Most competitive events consist of activities that are traditionally derived from hunting and combat skills. Over time these practices have evolved into a variety of competitive sports that include Archery, Pistol Shooting and Free Rifle. As with real-life shooting events, you will have full control over the aim of the weapon. You must also take into account the prevailing weather conditions and the athlete’s breathing pattern as these can both influence the accuracy of the shot. The graph below charts the compatibility with Triple Shot Sports since Dolphin's 2.0 release, listing revisions only where a compatibility change occurred. This page was last edited on 23 January 2018, at 10:58.